Artist's impression of the RM100mil Taipan@Ipoh Cybercentre project. GEORGE TOWN: Andaman Property Group, which is based in Kuala Lumpur, will develop six property projects with a gross sales value (GSV) of RM800mil in the Klang Valley and Ipoh next year. Andaman Property Management Sdn Bhd head of sales and marketing Vincent Tiew said of the six projects, one would be in Ipoh. In Ipoh, the plan is to develop landed commercial and residential properties while in the Klang Valley, the plan is to develop a mixture of high-rise and landed commercial and residential properties. The pricing, which is yet to be determined, will be attractive to lure investors, Tiew said. 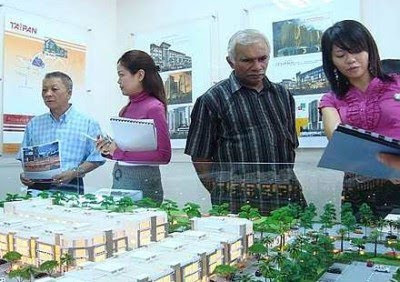 Potential buyers viewing a model of Andaman’s RM100mil Taipan@Ipoh Cybercentre project during its soft launch recently. This year, the group launched four projects two in the Klang Valley, one in Johor Baru and one in Ipoh with an estimated GSV of RM350mil. Ipoh is the group's focus as we have just unveiled the RM100mil Taipan@Ipoh Cybercentre in Bandar Meru Raya, he said. The project is a 1,600-acre integrated, self-contained township in North Ipoh Growth Corridor, which is being developed by Perak government. Tiew said the landed commercial and residential project planned for next year in Ipoh would also be in Bandar Meru Raya. The residential component will be priced affordably to attract first-time home buyers while the commercial components will be marketed to local and outstation investors with competitive pricing, he said. On the RM100mil Taipan@Ipoh Cybercentre, Tiew said the project saw 50% of its 102 retail lots sold during a three-day preview that started on Nov 26. 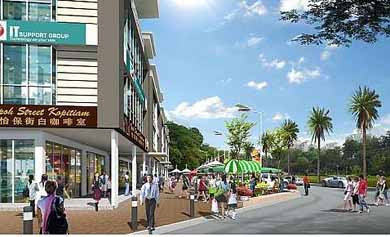 The three-storey retail lots, with a built-up area of 4,500 sq ft, are priced from RM688,000 while the four-storey retail lots, with built-up areas between 6,000 sq ft and 11,000 sq ft, are priced from RM1.5mil. Tiew said there were two key reasons for the brisk sales the features of the retail lots and the location of the project, which is close to the Perak MSC Cybercentre in Bandar Meru Raya. He said some 30 units had dual-frontage, which meant that they were accessible from front and back. There are 24 retail lots with 770-sq-ft to 1,200-sq-ft land in front of them that can be used for al fresco dining and other business activities. These units cost RM50,000 extra, he said.